David Krejci scored 1:46 into overtime to lift the Boston Bruins to a 4-3 win over Carolina, ending the Hurricanes' five-game winning streak. 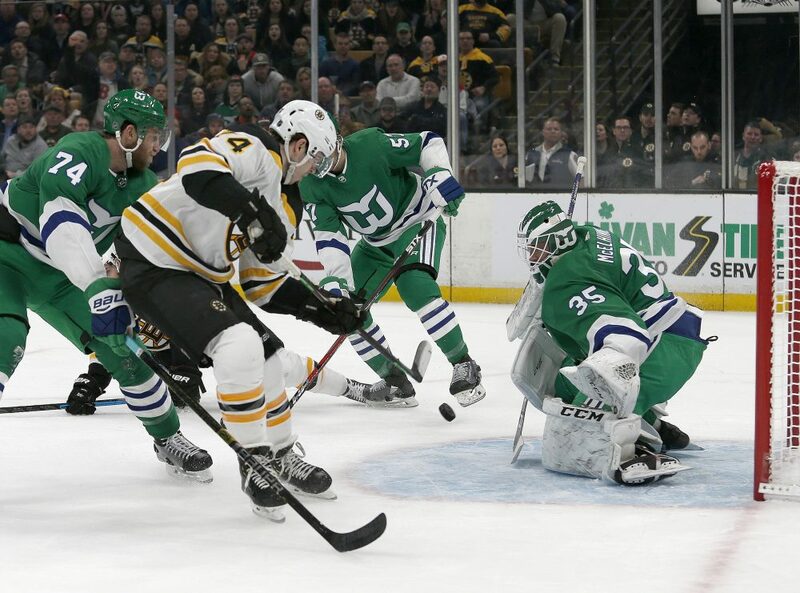 BOSTON — Jake DeBrusk had a goal, an assist and one very big steal to help the Boston Bruins keep rolling toward the playoffs. DeBrusk stole the puck deep in Carolina’s zone and made a centering pass to David Krejci for the game-winner 1:46 into overtime as the Bruins beat the Hurricanes 4-3 on Tuesday night. Krejci assisted on DeBrusk’s goal in the second period and both finished with a goal and an assist. Chris Wanger and Patrice Bergeron also scored for the Bruins, who rallied from a 2-0 deficit and have earned at least a point in 17 straight games. “We weren’t really playing our style and kind of playing into Carolina’s hands,” DeBrusk said of Boston’s slow start Tuesday. The Hurricanes had won five straight, but still salvaged a point after entering the night in playoff position at No. 6 in the Eastern Conference standings. “At the end of the day we were up and we’ve got to find a way to not let them get back into the game,” Carolina coach Rod Brind’Amour said. Brind’Amour said mistakes by his club helped lead to each of Boston’s goals, including Bergeron’s short-handed tally 2:45 into the third that put the Bruins up 3-2. “They’re good enough to get their own offense. We don’t need to give it to them and that’s the disturbing part,” Brind’Amour said. Another mistake that stood out was a crucial turnover in overtime. DeBrusk delivered a check on Carolina defenseman Justin Faulk and swiped the puck in the process, skating behind the net to the opposite corner, and then spun around with a perfect pass for Krejci. Bergeron’s short-handed goal came on a one-timer on a 2-on-1 with Brad Marchand. NOTES: The Hurricanes were wearing green uniforms with blue trim, the colors of the Hartford Whalers before the franchise moved to Carolina. … Jaroslav Halak stopped 35 shots for Boston. … De Haan returned after missing two games with an upper-body injury. … F David Pastrnak (thumb surgery) missed his 10th straight game for Boston.